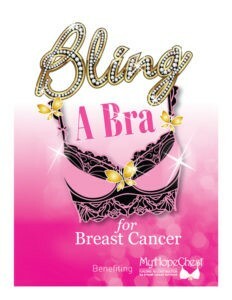 Bling A Bra for Breast Cancer ~Decorating Cups to Fill Cups! Name: Bling A Bra for Breast Cancer ~Decorating Cups to Fill Cups! Our NEW bra decorating contest will be a hit! Make a fun night of it… Winner gets a $500 Amazon Gift Card! It’s all about fun and FUN-raising to help breast cancer survivors! Contact us to receive the “How To’s” and create your fundraiser. My Hope Chest 3rd Party events are key to our success! Sign up to receive your “Butterfly Team Kit” with marketing materials to get you started early!